Emergency lighting (EL), by definition, provides illumination in the event of failure to supply normal lighting. While the basic purpose has not changed, however, the scope and complexity of the market has grown exponentially in recent years, thanks primarily to developments in control technology and in the lights themselves. Much like your fire system, emergency lighting is a vital tool in any building emergency and saves many lives around the world each year. As such, it is a legal requirement for public buildings in most countries and those responsible for it must guarantee its functionality and compliance to the relevant local standards and legislation. The way emergency lighting systems are specified and managed has evolved rapidly over the past decade, resulting in reduced costs for testing and ongoing maintenance. While the basic code of practice (BS 5266-1) has been around for a number of years, the rules and regulations have been tightened significantly. For example, the UK’s Regulatory Reform Fire Safety Order (2005) reinforces the requirement for an adequate emergency lighting installation and it is this regime that many installers in the Gulf region will choose to follow. An automatic emergency light testing panel. Whereas emergency lighting systems were previously seen as unfriendly and relatively dumb, modern systems are becoming much smarter and user-friendly. Even the standards are changing, giving emergency lighting systems and testing regimes a much more prominent role in building evacuation and emergency strategies. Offices and public spaces tend to be much more design-conscious, with polystyrene ceiling panels and glaring fluorescent fittings falling out of favour in some cases. Old-style standard emergency luminaires are no longer the automatic choice and modern EL systems can convert almost any commercial light for emergency use. Many companies do, of course, still offer a standard range of luminaires, including fire exit signage and bulkhead lights, but the options are now far wider, thanks to enhanced customisation and LED technology. In addition to linear LED lighting, recessed downlighters and LED panels, companies with ICEL 1004 approval can also re-engineer virtually any luminaire, within reason, for emergency lighting usage. LEDs offer huge design, power and environmental gains over fluorescent lights and represent the biggest recent change in the EL industry. LEDs as a light source also last longer. Compare for example 50,000 hours typically for LEDs, with maybe 7,000 hours for fluorescent-based products. The light source should no longer be the primary reason for failure, which reduces the need for bulb replacement within a planned maintenance strategy. The lower power usage also means that LED luminaires can be installed with smaller battery packs, which has both aesthetic and logistical advantages. Small control and monitoring devices sit within the luminaire. The other area of rapid change is around testing and maintenance regimes. New procedures and standards require improved light testing, as well as better evidence. It’s this evidence of compliance that protects responsible people, and (because it implies a perfectly operating system) building users. Emergency lighting should be tested monthly and annually in accordance with EN 50172. This standard stipulates that testing should simulate the conditions when the emergency lighting may be called upon, for example a mains electricity failure. Typically, a monthly test of 10 minutes duration will be satisfactory, whilst a full rated duration test (usually three hours) should be completed annually. Test results must be recorded and any remedial work performed within an appropriate time frame. The manual testing of systems is still common, but as maintenance timeframes grow (with LED technology) and budgets shrink, so the cost of engineers spending a significant amount of time on manual testing is increasingly hard to justify. Similarly, sites will sometimes have a number of testing regimes and systems in place, increasing complexity and management and compliance costs. Fortunately, the era of one EL test system is also here and the ability to convert almost any light, even very specialist kinds, for EL use makes this increasingly possible. Automatic testing systems (ATS) are becoming a vital tool and, like LEDs, they have developed to offer many innovations and efficiencies. ATS units are usually control panels, connected to addressable lights, or lights with addressable modules, much like addressable fire systems. Some ATS systems are limited to fixed emergency luminaires, while other more flexible systems allow these addressable modules to be installed within bespoke units, such as high bay lighting. These systems also allow luminaires to be tailored for specific environments like clean rooms or operating theatres. Every device on a ATS network, including the luminaires, can communicate with the control panel in order to facilitate seamless monitoring and management of the system. It’s possible to control new and old emergency lighting, or a mix of the two, via this method, removing at a stroke the need to test and observe each light individually. Systems can now be monitored via the cloud. 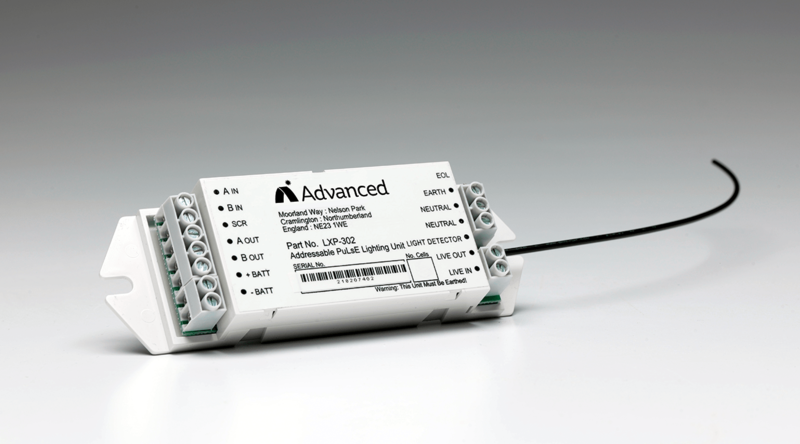 Typically, a small addressable device, such as Advanced’s own Pulse Light Unit (PLU), sits within the luminaire, controlling the light and monitoring its power supply, battery condition and lamp status. Any faults or potential faults are automatically relayed to the control panel. These systems allow tasks such as testing to be completed without human intervention. They can deliver prompt and accurate reporting of test results, as well as providing definitive work instructions for any necessary maintenance, which leads to significant time and cost reductions. Addressable systems also solve the issue of keeping buildings safe while testing is underway. Automatic testing allows buildings to be tested outside their normal hours of use, as testing some areas like busy offices or operating theatres must be planned to fit around normal operations. Automatic testing also eliminates the possibility of human error, as well as immediately flagging up any remedial requirements. Such systems are recommended by ICEL (The Industry Committee for Emergency Lighting) as a benchmark for new and refurbished emergency lighting installations. 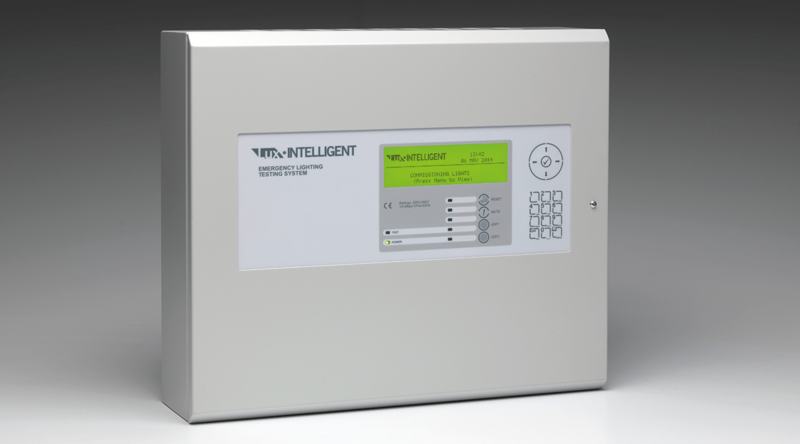 They provide a simple, but effective, way to monitor and manage emergency lighting. They can allow remote access to installations using the Cloud (internet) to access the very latest status and test reports, even via a mobile phone or tablet. 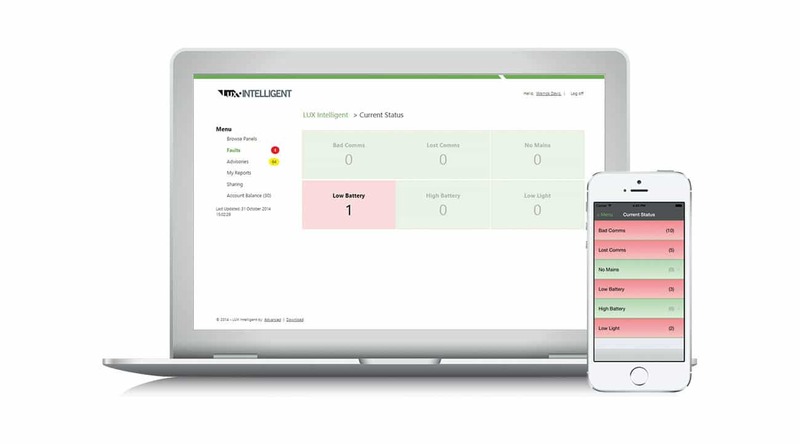 In effect, this means that businesses with multiple sites and buildings can have all of their emergency lights on a single network, with all testing, programming, maintenance and compliance data safely stored and archived in a remote location. Like all evolving technology, taking full advantage of the possibilities offered by modern emergency lighting systems requires joined up thinking. Yes, you can adapt existing installations with smart panel technology, or update luminaires in certain spaces without the need for changing the whole system, but then you have multiple systems and an increased management problem and associated costs. The advantage with systems like Advanced’s Lux Intelligent is that the solution can be rolled out in one installation, or alternatively extended piece by piece until all emergency luminaires have been adapted/replaced and added to the system, allowing the end user to manage their costs and timeframes. If you want to effectively integrate emergency lighting while keeping it as unobtrusive as possible, it’s vital that it is treated as an integral part of the design process from the outset, along with the main lighting systems, the fire systems, IT networks and other infrastructure. In this way, you can take full advantage of the opportunities offered by self-test panels, LED lighting and other components. Technological development in this sector has been relatively rapid, but it shows no sign of slowing down. In the near future, we are likely to see a move towards even more intelligent systems that focus on directing the public towards a specific exit route, as opposed to simply lighting up the area. The technology to do this does exist, but with limited guidance legislation, the jury is still out on whether the public will take notice, or simply follow the crowd. In an ever-changing world, standards are also evolving. It is not just a case of ensuring escape routes are provided, and illumination is specified to complete hazardous tasks. You also need to provide standby or ‘stay-put’ lighting to allow for the non-evacuation of buildings if it is not deemed necessary. Understanding the possibilities in emergency lighting today is vital for installers, consultants and end users, especially as in the medium term it is likely to become a key part of the wider evacuation strategy and as such will gain more and more prominence. Dave Henderson is Emergency Lighting Product Manager at Advanced. He has 15 years experience in the industry and self-testing, including in specialist areas such hazardous environments and across engineering, sales and product roles. He is a Member of the ICEL Council Committee and also represents Advanced on various working groups at the FIA and various BSI committees.